Even though he didn't play much at all in the Finals against Edmonton this year (appearing in one game in the Finals, five in the playoffs all together), Oleg Tverdovsky still stands as a member of this year's Stanley Cup champions, the Carolina Hurricanes. Tverdovsky also won the Stanley Cup with the New Jersey Devils in 2003, meaning that (with 2005 being the lockout year), Oleg has been on two of the last three Stanley Cup-winning teams. In between winning the Stanley Cup in '03 and '06, Tverdovsky played two seasons with Avangard Omsk over in the Russian Super League. 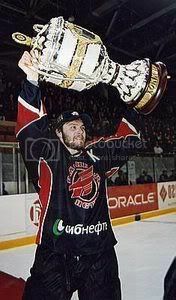 Avangard Omsk won the Russian title in 2004, making it three years out of four that Tverdovsky's team has won its League's championship. As the RSL champs in '04, Avangard qualified for the IIHF's European Champions Cup tournament (a tournament that includes the title-holders from six different European leagues) in 2005, which Avangard then won. The ECC tournament takes less than a week to play out, and is hardly the two-month-long grind that the Stanley Cup playoffs are, so depending upon how you want to look at it, Tverdovsky has won four championship Cups (or three) over the last four years running. Tverdovsky made mention of this feat in Sport Express, after Carolina's victory last week: "It is unbelievable to me that in the last four years, my teams have won four finals. Maybe this will sound cocky, but let's see if anyone else can repeat this!" Tverdovsky, who was born in Ukraine, is one of handful of Soviet-born/Russian players to have been on two Stanley Cup-winning teams as a player. Sergei Fedorov and Igor Larionov each won three Cups (over six years) playing for the Detroit Red Wings, while Slava Fetisov won two as a player with Detroit and one as a coach with New Jersey. 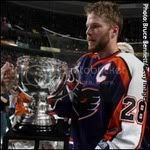 In what remains one of the world's enduring mysteries (along with crop circles, Easter Island, and Stonehenge), as was commented on here earlier, "Void" Kane has been on the AHL Calder Cup championship team two years in a row-- with the Philadelphia Phantoms in '05 and with Hershey in '06. The most ironic thing about that very first Cup Oleg (and his team) earned? It was against his NHL rookie team, the (Mighty) Ducks. 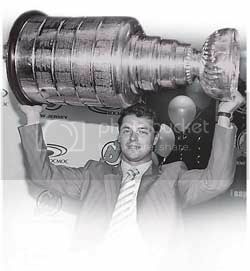 Rather frightening how close Oleg and another team of his came to having to earn Lord Stanley that way again. Championship hardware seems to follow Tverdovsky around, even when he's a part-time player (though, to be fair, he was still one of the best defensemen in the RSL the previous two years-- Omsk team captain, 16 goals in '03-'04). So Naz and the rest did have some actual insight when they were touting Oleg as a key to the Cup, then. Speaking of the Stanley Cup and being prescient, GD, you had your post on František Kaberle earlier in the month, and then he notched the GWG in Game Seven. That's gotta deserve a gold star, or something. You have no idea how much of a relief that was -- after all my babbling about FK, I fully expected that Game Seven would end with him coughing up the puck to Pisani for the game-winning goal. Kinda like how I spent the beginning of the season yapping about how awesome Fedor Fedorov was going to be on the Wolf Pack, only my prediction didn't turn out so great. Hey, my Purinton jersey's flippin' sweet.